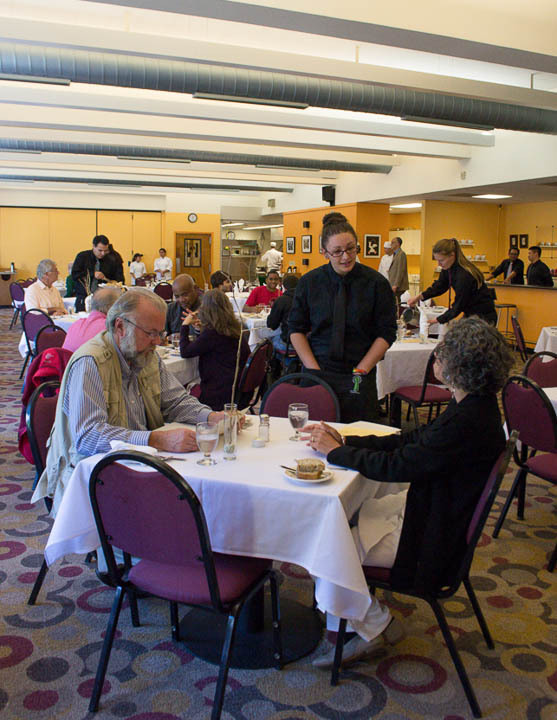 All San Franciscans know of hidden gems in the city, but many aren’t aware that there is one on Ocean campus—The Pierre Coste Room. The Pierre Coste Room is tucked away behind the cafeteria and the Student Union building in the Statler Wing where it offers a fine dining experience within a college student’s price range. 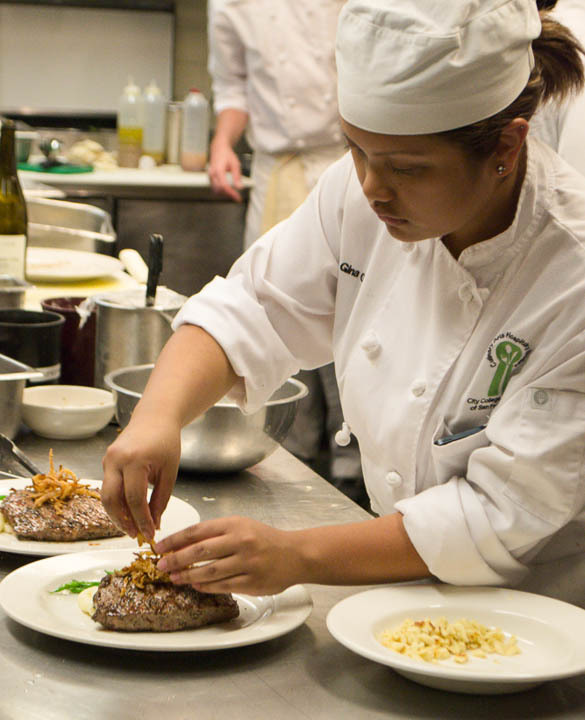 “Our food is not expensive for what you are getting,” Culinary Arts and Hospitality student Esther Cartoon said. The menu includes four types of salads, nine entrees, a soup of the day and various hot and cold beverages. There are many options to choose from with the most expensive entree, the lamb blanquette stew, ringing in at only $12.25. The Pierre Coste Room is available to students and faculty as well as to the public. The restaurant focuses on being as sustainable as possible. Pastas and sauces are all made from scratch. There are no frozen vegetables in sight and produce is generally from local farmers. French style tableside cooking is a feature available allowing guests to see the food cooked first hand. As you enter the restaurant, the calming noise of a waterfall fountain sets an elegant ambiance. Tables are dressed with white tablecloths, perfectly folded napkins and sleek centerpieces that all scream fine dining. The Pierre Coste Room also has a diverse group of students to cater to anyone who enters looking for a great meal and a welcoming experience. Mandarin, French, Tagalog, along with Portuguese and Spanish, are some of the languages the students at the restaurant are fluent in, which is important given the high cultural diversity on campus. “We are lucky to have access to this resource,” student Scott Pattison said. Whether you are ending your day of classes or just taking a break in between, The Pierre Coste Room is a nice place to unwind and enjoy a well cooked meal. The Pierre Coste Room is open Monday through Friday from 11:15 a.m.-12:30 p.m.